VMware announces Horizon 7 and Workspace ONE – What are the cool things? Ahead of their big unveiling events today and tomorrow VMware has announced two major new product updates: VMware Horizon 7 and VMware Workspace ONE. Let's look into what it is all about.There is a truckload of information already available on the different blogs - because VMware has allowed bloggers that were briefed to share the details today. I will talk about some of the features that really intrigue me and refer to some other sources. First the highlights. Unified App Store – plugable architecture which becomes a collection of entitlements for the users. Workspace One App for IOS, Android and Windows. 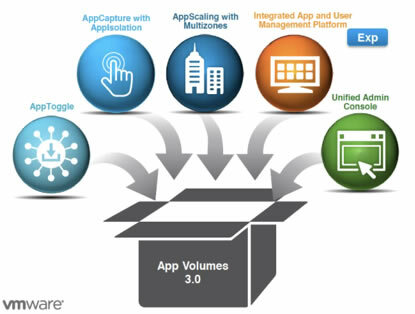 Integrates web, mobile, cloud, Windows, Horizon and Citrix. Simple onboarding with e-mail address. Email and Content Apps – Integrated Email and Calendar system built for business. Integration platform for common worflows. Emails are protected on any device for malicious file attachments. This would be the Boxer acquisition. Compliance Check Conditional Access – Sensitive data are protected by restricting access. It’s a policy engine which manages that. 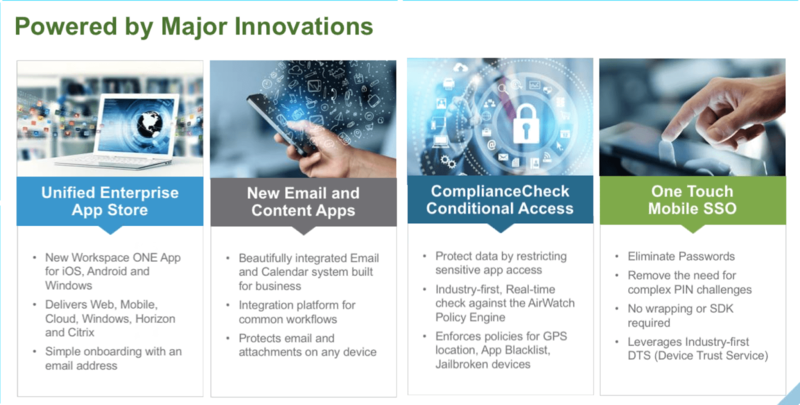 The policy engine resides in AirWatch. It’s possible to enforce for GPS location, App Blacklist or Jailbroken devices. One Touch Mobile SSO – Eliminate passwords. No need complex PIN. Has new technology leveraging DTS (Device trust service). Without VPN, Cloud-based Kerberos Key distribution. More details are available from Brian (or Jack actually) Madden, Rob Beekmans or Vladan Seget. I really like the overarching message and applicability of this set of products to a large market. Not everyone is ready to go all mobile nor is everyone still on Windows XP with apps running from network shares. With this offering VMware can allow you to be bleeding edge without having to do away with what you have. It seems integrating identity management and EMM (along with virtual desktops, web SSO, and other things) is clearly the way forward for end user computing. One of the capabilities I want to highlight that I like that VMware is selling security to end users - which is where the sale (or acceptance) really is made. Let me explain. With the combination of the new capabilities Compliance Check Conditional Access and One Touch Mobile SSO IT has the possibility to offer security to their business consumers that actually makes the life of the business employee easier instead of harder. That's a huge benefit towards user acceptance and overall success of the project. Horizon 7 'just' is the next major version of VMware Horizon. There is a ton of new stuff. Again, Brian (Gabe actually) Madden, Rob Beekmans or Vladan Seget have more information. I'll pick some highlights that I personally think are very interesting. AppToggle lets you deliver single applications from an AppStack with that contains multiple apps as opposed to delivering the entire AppStack. AppToggle allows you to turn on/off applications, not just hiding. This should allow you to have less AppStacks, and easier management. It will depend on the ease of use and management to see how popular this functionality will be. Then VMware also announced Blast Extreme Experience, an upgrade from the VMware Blast protocol that already exists today. The big thing about it is that it seems to offer feature parity with PCoIP on all platforms. It almost seems to good to believe but who knows. 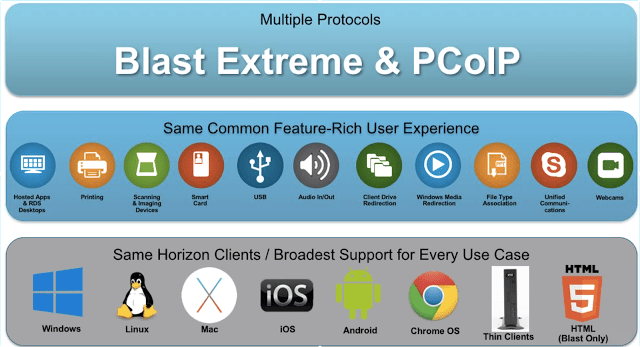 In fact, it seems Blast Extreme seems to be better than PCoIP because Blast Extreme uses less bandwidth, is better on bad networks (VMware claims it handle 20% packet loss and still present a reasonable user experience), less client side CPU and has / is an HTML5 client allowing for access from almost any device. This only reaffirms to me that the protocols we are seeing today will do for the bulk of all use cases. The final cool thing is not so much a product feature but more of an attitude. VMware has acquired quite a few companies lately in with this release you can see all of that (starting to) come together. Having been a part of a few acquisitions myself, I know that it is very easy to share the plan that you will integrate stuff fast but actually doing it is a second thing.